Project Overview:	Geo Lab Drilling was contracted to install 43 electrode nodes for a thermal remediation design at a former industrial site. The project design required the nodes to be installed inside 12" diameter boreholes, which were located inside of, and adjacent to, the facility building. Geo Lab accomplished this by turning 8.25" hollow-stem augers utilizing our CME-55 mobile drill rig, as well as our track-mounted Geoprobe® 7822. In addition to the electrode installation, temperature probes were installed throughout the area inside and outside of the building using 4.25" hollow-stem augers. Upon reaching the target depths the electrodes (~40' bgs) and temperature probes (~20' bgs) were carefully installed and a conductive media of graphite and steel shot were placed into the borehole. Geo Lab committed two rigs and several key personnel to ensure the project scope was met, all while adhering to a rigorous health and safety plan implemented for the site. Project Challenges: Nearly half the electrode and temperature probe installations were completed within the site building. Ambient summertime temperatures coupled with drill rig exhaust inside the unventilated building necessitated several large fans present to constantly move air in and out of the workspace. Additionally, monitoring of the breathing space for elevated concentrations of soil gas vapors during drilling activities resulted in the need to don respirators when engineering controls alone were insufficiently providing a "VOC-free" environment for the workers. 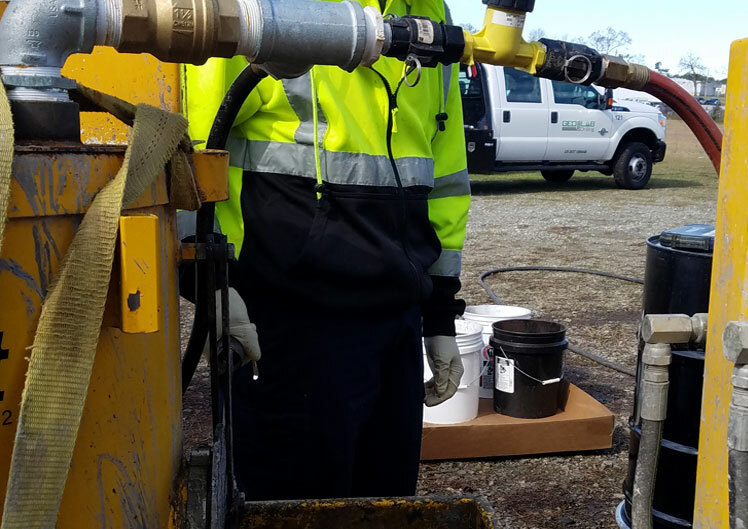 Project Overview:	Geo Lab Drilling successfully completed an In-Situ Bioremediation injection event utilizing SRS-SD® emulsified vegetable oil (EVO) with KB-1® Plus bioaugmentation amendment to promote dichlorination of chlorinated solvents contaminated soil and groundwater at the site. A total of ~2,800 gallons of EVO, ~19K lbs of sodium bicarbonate buffer, and ~55K gallons of water were injected over the 20-day project duration. This included the handling of material to allow for 109 batch mixes being processed within secondary containment areas and then injected into ~70 injection points and ~220 injection intervals, at depths ranging from 15' – 60' bgs. Following the EVO injection, each interval received a specified volume of anaerobic chase water to condition the groundwater prior to, and following, the inline injection of "cultures" into the aquifer using Nitrogen gas. Geo Lab utilized two of our track-mounted Geoprobe® units and numerous injection rods to facilitate distribution of the injectate materials in an elaborate array of injection intervals across a fairly compact treatment area in relation to the volume injected. Project Challenges: Adherence to the spill prevention plan requirements for the site required numerous adjustments to flow rates during the injection event in order to eliminate daylighting issues immediately. Additionally, the KB-1® Plus needed to be stored at a temperature between ~45-60 degrees F to keep cultures viable prior to injection into the subsurface; doing so when site temperatures exceeded 90 degrees F required the vessel to be stored in a large cooler with lots of ice and the vessel temperature routinely monitored throughout the 20-day project. 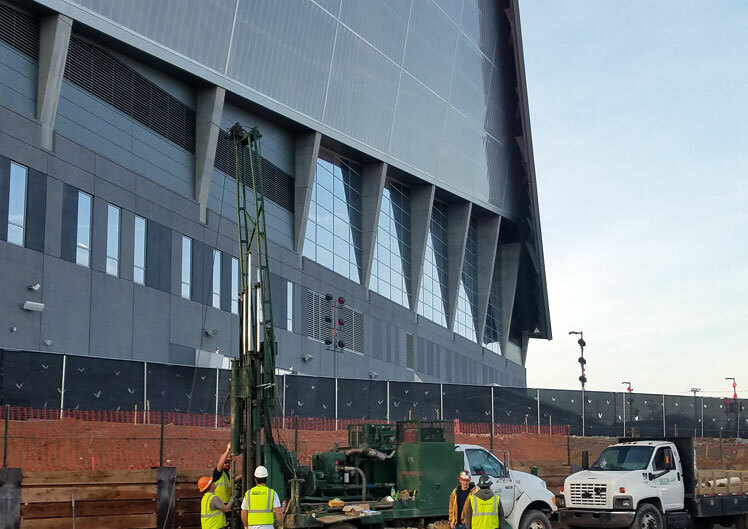 Project Overview:	Geo Lab Drilling was contracted to advance numerous borings and provide SPT sampling services at the site of the former Georgia Dome to facilitate a geotechnical engineering investigation that was to be utilized in the planning of the site's future redevelopment. Project Challenges The project site was extremely active with numerous heavy equipment operations (cranes, trackhoes, dump trucks, bedrock removal, etc.) taking place within 100' of drilling locations throughout the project site. Vehicle spotting and foot-travel throughout the site was detailed daily during tailgate safety meetings as a primary hazard to be constantly aware of while on-site. 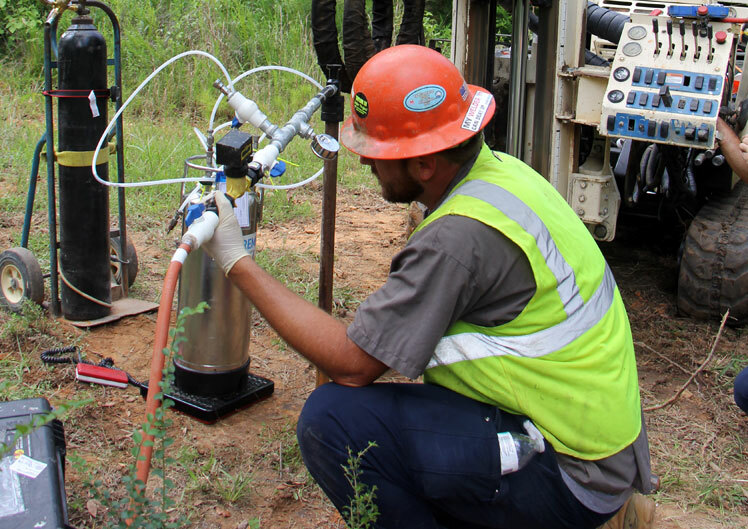 Project Overview:	Geo Lab Drilling successfully injected in excess of 270,000 lbs of Peroxychem EHCTM ISCR Reagent into the subsurface at a closed RCRA landfill site near Mobile, AL. The project was completed within a 90-day period utilizing multiple Geoprobe® track-mounted units that facilitated DPT injections, along with ChemGrout® units used for mixing the reagent into a pumpable slurry, which was delivered into the subsurface at various depths to form a permeable curtain for groundwater to travel through across the site. The treatment area was approximately 103,000 square feet, and a top-down injection approach was utilized to deliver the reagent, typically at an average flow rate between 5 – 8 gpm. 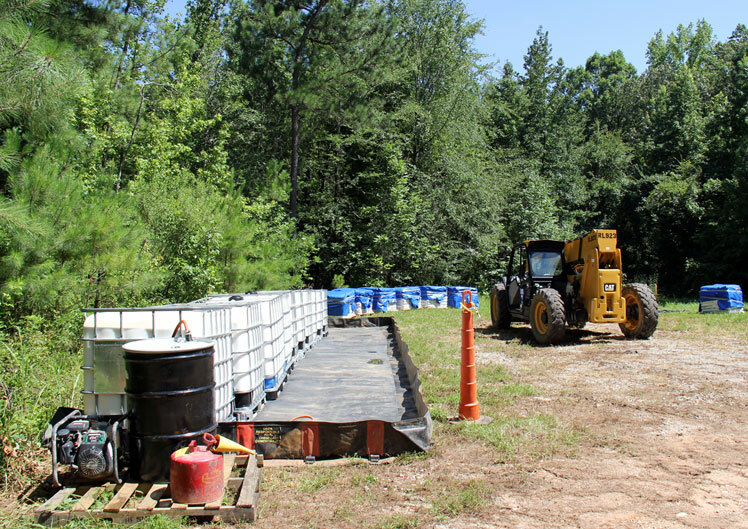 In addition to the injection event, greater than 60 wells (2" and 4" diameter) were installed as part of the remedial design and the network monitoring program approved for the site. All well installation was completed with Geo Lab's Geoprobe® 7822 using hollow-stem auger drilling techniques. Project Challenges: Project success was shrouded in excellent communication and teamwork, both internally through the on-site management of the 12-man crew, and with the on-site client and off-site project managers. Long hours, brutally hot weather, daily shutdowns due to thunderstorms and maintaining equipment in a proper fashion to provide consistent production rates through the injection scope proved to be constants throughout the project. 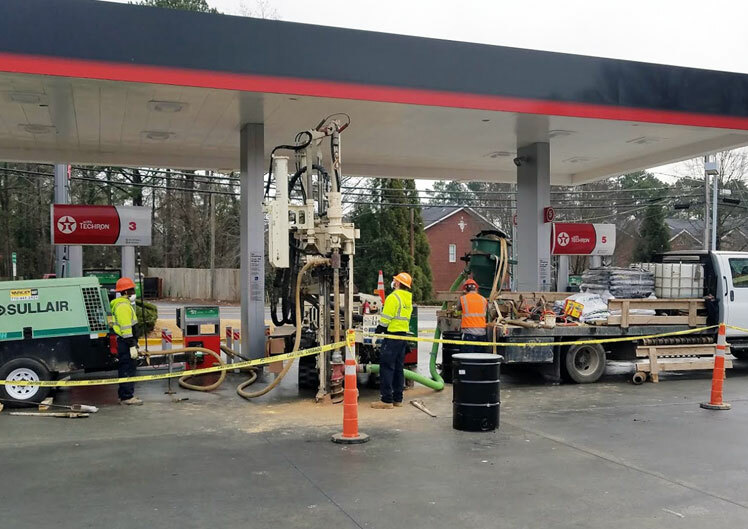 Project Overview:	An Atlanta-based client hired Geo Lab Drilling to install remediation wells for an air-sparge / soil vapor extraction system at an active gas station. The footprint of the site was small, the facility was to remain open during drilling activities, and the location of the wells presented low-clearance requirements. 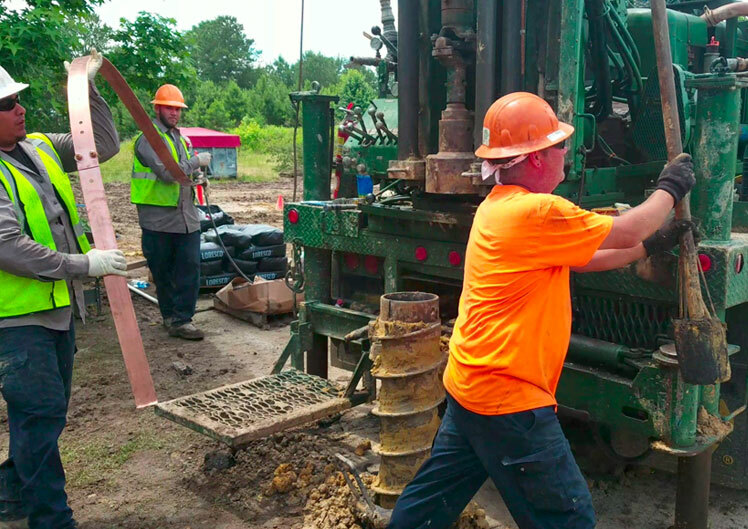 Additionally, the shallow depth to bedrock at the site required that the installation of the wells be facilitated using DTH Air-Hammer techniques. A total of six wells were installed during this initial phase of the project. Geo Lab utilized one of our Geoprobe® units and a pull-behind air compressor to advance the 6" air-hammer tooling to the design depths of the project specifications. A cyclone unit was deployed for effective dust suppression during drilling activities. Project Challenges: Active sites always present challenges with respect to vehicle and pedestrian traffic and this site was no different, especially with the footprint being so small. Keeping dust and flying debris from coming in-contact with the patrons of the store was the highest priority and in-line with the overall safety plan for the project. Additionally, working under the canopy of the pump islands and in close proximity to underground utilities and product lines crossing the site required additional safety precautions to be taken prior to drilling. 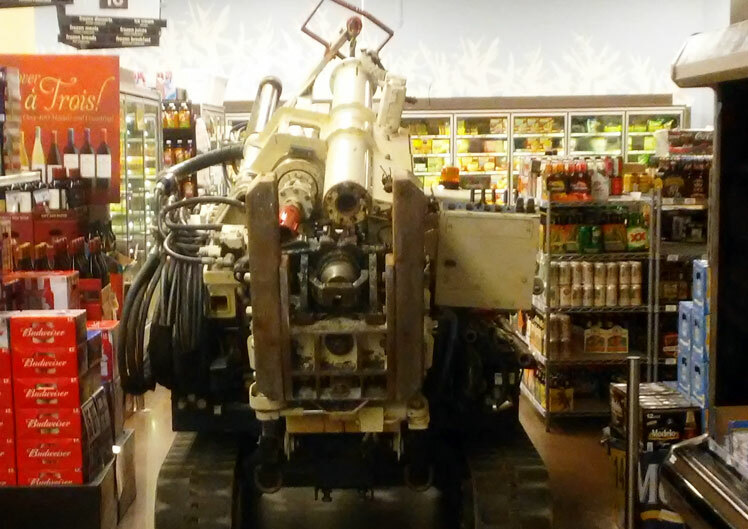 Project Overview:	Geo Lab Drilling was contracted to install several DPT borings to facilitate soil and groundwater sampling, as well as sub-slab vapor implants for collection of soil gas vapor samples, in an active grocery store. The vapor implants were completed using minimally invasive procedures to minimize damage to the flooring of the building. Hydration of granulated bentonite to seal the conduit from vapor implant to ground surface was completed prior to helium leak detection being performed on the vapor implants to verify the sampling intake below-grade was not connected to the atmosphere within the building. Project Challenges: The project scope within the active grocery store required our work to be performed after hours. As you can tell from our site photo, clearance between aisles was limited and (of course) took us by the majority of the "bottled items" in the store! The crew performed flawlessly on a scope-filled overnight project, left no trace of being on-site, and never came close to damaging inventory at the store. ©2017 Geo Lab Drilling, Inc.